Highway 20 west from Williams Lake to Bella Coola travels through the vast and interesting Chilcotin. The Coastal Mountains form the western boundary separating the rain forests and fjords from the plateau dotted by lakes, streams and rolling grasslands. This is home to the Chilko River with headwaters at Chilko Lake. Chilko River, a turquoise blue-green colour cuts its way through rugged terrain as it rushes to join the Chilcotin River and finally the mighty Fraser River. Both the Chilko and Chilcotin are popular with whitewater rafters and offer radical rafting excitement. Imagine dropping 20 metres per kilometre (1,500 feet in 15 miles), but that is what happens on the Chilko River. Lava Canyon, a 19 km (12 mi.) section of the river, is where rafters will experience this exhilarating ride. Raft the complete 107 km (67 mi.) length of the river or just sections. This river ranges from a grade one up to a five with extreme rapids, big drops and narrow passages. Guided whitewater rafting operators offer packages customized to fit you and your family. The Chilko River has a reputation of being one of the finest river trips in Canada. Find out for yourself. The Chilcotin River, with headwaters in the wilderness region near the Ilgachuz Range, winds its way through mountains, open valleys, grasslands and canyons as it hurries to meet the Fraser. As it rushes along, the Chilanko and Chilco Rivers join in, making it another excellent rafting river in the Cariboo Chilcotin. From the high alpine to the desert canyons, rafters will encounter rapids, eddies, rocks, narrow spots, standing waves and boulder gardens. This river is graded from one to five as you raft the White Mile and Farwell Canyon. Enjoy running the Chilcotin River with a knowledgeable rafting guide. There are qualified and experienced whitewater rafting establishment in the region who will gladly customize a rafting tour for your party. Whitewater rafting the Chilcotin River takes you by interesting and abundant wildlife, with plenty of photo opportunities. Enjoy running the continuous whitewater on the Chilcotin River offering new wilderness adventurers around every bend. British Columbia's longest river, the fifth longest in Canada, is the Fraser River. Starting in the Rocky Mountains at Mount Robson, the Fraser River stretches for 1,368 km (848 mi.) and flows into the Pacific Ocean. It starts as a meandering waterway that eventually becomes a rushing river picking up silt and accumulating volume as other rivers and streams feed it. At Prince George, in central BC, the Fraser heads southward through the Interior Plateau. Soon, the fast flowing waters make their way through old volcanic rock, forming deep and narrow canyons including the dramatic Fraser Canyon. This is where the Fraser makes its way through a narrow 34 metre (99 foot) gorge, known as Hell's Gate. The Fraser Canyon is the section of river that offers the ultimate in river rafting. Qualified tour operators take customers in motorized inflatable rafts down river to run the rapids from Boston Bar to Yale. Rapids like Scuzzy Rock, China Bar and Hells Gate. This one day excursion is open from May to the end of August offering thrilling and exhilarating rides. See and feel first hand the energy of the rapids and whirlpools, as the raft churns rushing downstream. 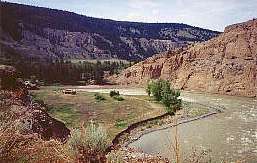 The Nahatlatch River, which flows into the Fraser, is another very popular rafting river. The fury of white water on the Nahatlatch offers an exuberant and thrilling ride, all under the control of experienced and knowledgeable river raft operators.